The seasoned caravanner can hitch up a caravan while blindfolded, but for the rest of us, many of the finer points aren’t very obvious. 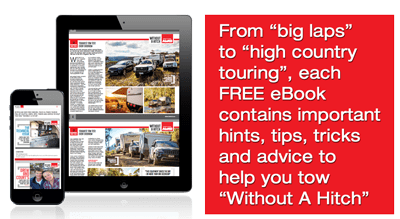 Whether you’re new to caravanning or it has been a while since your last tow, our step-by-step guide on how to hitch a caravan will have you on the road in no time. Important: Ensure that all gas appliances are turned off and that the gas is turned off at the cylinder. Important: Ensure that the 240V power lead is physically disconnected from the caravan. Before hitching a caravan, check that the caravan’s electrical lead matches the socket on your tow vehicle. If it doesn’t, use the appropriate adaptor. DO NOT tow the caravan without connecting the electrical lead to the tow vehicle. Raise the corner steadies and stow away corner steady pads or boards. Remove chocks from tyres. Note that you may wish to leave the chocks in place if you’re on uneven or sloping ground. Where required, attach the jockey wheel to the draw bar. Wind the jockey wheel up so that the coupling rests just above the height of the tow ball. Reverse your tow vehicle so that the tow ball is positioned beneath the coupling head. Depending on the tow ball weight of your caravan and its proximity to the tow vehicle, you may be able to drag the draw bar into position rather than reversing your tow vehicle. This is not recommended if you’re positioned on uneven or sloping ground. Lower the jockey wheel so that the coupling sits on the tow ball and the tow bar supports the full weight of your caravan. Lock the coupling onto the tow ball in place by engaging the coupling latch. In the case of stabiliser couplings, engage the stabiliser lever to lock the stabilising pads against the tow ball. Raise the jockey wheel into its travelling position or, in the case of older models, remove the jockey wheel and stow it appropriately. Cross the safety chains beneath the tow bar/hitch and secure (s) to the tow bar with D-shackles. In the case of weight distribution hitch, attach the spring arms to the tow bar assembly and latch the chains to the draw bar, as per the manufacturer’s instructions. Ensure that the tow vehicle and caravan are level. If they’re not, you may need to adjust your payload distribution or, where applicable, adjust your weight distribution hitch. Take note of the tow ball mass recommended by your tow vehicle’s manufacturer. Connect the caravan’s electrical lead to the socket on the towing vehicle. Where an ESC system is configured with separate control and power, attach both the control and power leads. Gather up any slack from the electrical lead to avoid it dragging on the road or catching on obstacles. Likewise, shorten the safety chain(s) by moving the D-shackle along the chain to reduce slack . For trailer’s over 2-tonne and fitted with a breakaway, connect the breakaway lanyard to the tow bar. Where used, remove the chocks from the tyres and stow away. Ensure that the caravan’s rear lights are working correctly. Once your caravan is securely coupled, double check the site for any tools and equipment that may have used on or removed from the caravan in the process. Don’t forget to fit your caravan mirrors!